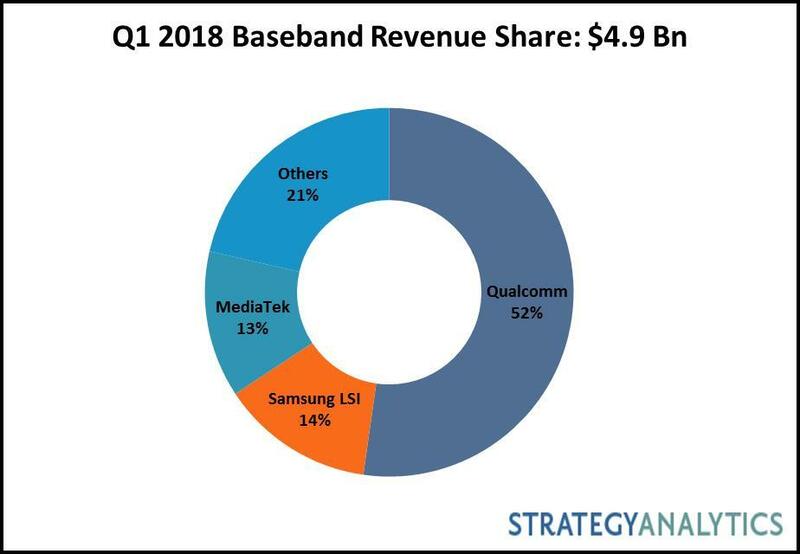 This research report from Strategy Analytics estimates that Qualcomm , Samsung LSI , MediaTek , HiSilicon and UNISOC ( Spreadtrum & RDA ) captured the top-five revenue share rankings in the global cellular baseband processor market in Q1 2018. Qualcomm continues to gain market share and finishes Q1 2018 with 52 percent baseband revenue share followed by Samsung LSI with 14 percent and MediaTek with 13 percent. The LTE baseband segment continues to be the sole positive performer registering an impressive 9 percent shipment growth in Q1 2018 while contrasting with double-digit declines in the 2G and 3G baseband segments. MediaTek and UNISOC (Spreadtrum & RDA) continue to cede market share and Q1 2018 was no exception. Altair , HiSilicon , Intel , Qualcomm , Sequans and Samsung LSI all grew baseband shipments year-over-year in Q1 2018.